For the past couple of months and as time permits . . . 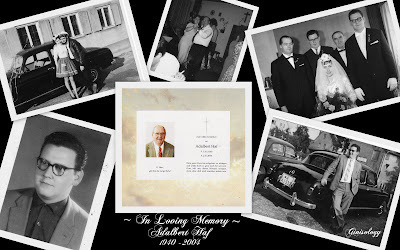 I have been scanning and organizing the many photos I received when my grandmother and mom passed away in 2010. I created a photo album of my maternal Haf line in a timeline fashion. It turned out great and I am happy with the results. It sort of tells our story in photos and instead of photos being in boxes, they are out for us all to look at when we like . . . eventually, I want to make it into a book which will be much easier now that the photos are already in order. 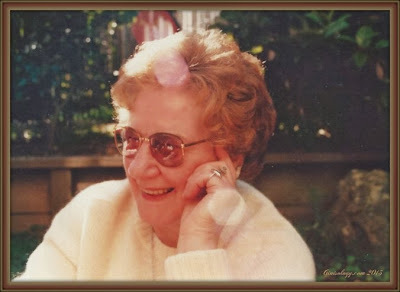 As I was creating this photo album, I came across this photo of my Oma . . . I just smiled . . . this is such a natural and wonderful photo of her . . . now my favorite. 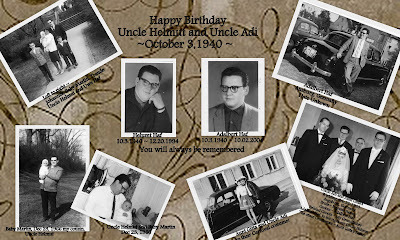 Adalbert (1940 ~ 2004) identical twins, were born in Augsburg, Germany, to Adalbert and Liselotte Haf née Kaiser-Saule. Dates and names to many of my German maternal family who are in photos ( my personal photo collection) that I inherited when mom and Oma passed, are unknown at this time. My cousin, Marion in Germany and I are working together with her mom, my Aunt Gitta, to determine dates and persons in many of the photos that mom and I were going over prior to her death in July of 2010. I hope to fill in the blanks to many or all of these photos.